This classic style guitar package from Davison includes everything you need start playing right out of the box. The full size 39″ guitar features a maple fretboard and maple neck. The 9x9x5″ amp has both clean and distortion settings and a gig bag case, guitar strap, cable, pics, and pitch pipe are all included — so you will need nothing else when you get your new guitar package from us. Plus, this FULL SIZE guitar guitar package costs less than most junior packs! The Davison Guitar Company is highly regarded for making quality guitars at amazing prices. 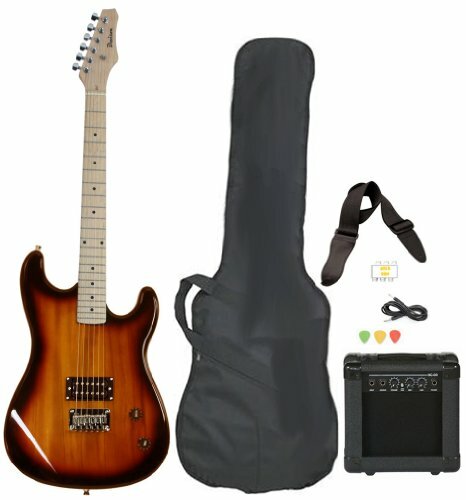 We are impressed with this guitar package and know you will be too! Makes the ultimate gift.